Michelle and Jim Bob Duggar pose with the fam. The oldest member of the 19-child Duggar family is proving that the apple doesn’t fall from the extremely fruitful family tree: On Thursday, Josh Duggar revealed live on TODAY that he and wife Anna are awaiting the arrival of their second child. “We’re expecting!” a beaming Anna Duggar told Meredith Vieira via satellite from Springdale, Ark., as her battalion of in-laws looked on. Anna said that she and Josh, both 22, found out they’re in a family way on Oct. 8 — a special day for them, as it’s their daughter Mackynzie’s first birthday. Though Josh was joking when he told Vieira that he and Anna “might be going for 25” children, he does already have a head start on his mom and pop: Jim Bob and Michelle Duggar married in 1984, but didn’t welcome first child Josh into the world until four years later. Josh and Anna’s second child is due June 19, three months before the couple’s third wedding anniversary. That Anna is ready to give the Duggar family a new addition is a special blessing after parental heartbreak: Just months after Mackynzie was born, Anna learned she was pregnant again, only to miscarry. Anna told Vieira she thought long and hard whether to reveal the miscarriage, but decided that talking about it could help others. Devout Christians like all the Duggars, Anna and Josh put their faith in a higher power during troubled times. Religious beliefs have much to do with the family’s large size. Jim Bob and Michelle Duggar practiced birth control early on in their 26-year marriage, and after Josh was born in 1988, they returned to it. But after Michelle suffered a miscarriage, the Duggars vowed to put their faith in God and have as many children as they could be blessed with. 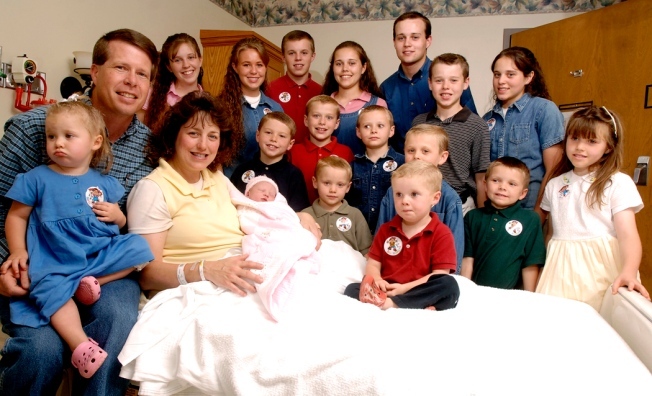 Since then, Michelle Duggar has given the family 19 children through 17 pregnancies (two resulted in pairs of fraternal twins). The last of the 19, little Josie Brooklyn, was born in December 2009 — making her two months younger than her niece Mackynzie! Duggars Q&A: What’s the hardest part of having 19 kids? Speaking with Vieira on TODAY Thursday, Jim Bob Duggar clearly reveled in the news he’s going to be a second-time grandpa. “This doubles our grandchildren — we’re really excited about our new grandchild,” he said. The gender of Josh and Anna’s second child is not yet known. Jim Bob and Michelle have 10 boys and nine girls; the birth of grandchild Mackynzie evened the gender lineup. Josh Duggar told TODAY his sisters are especially hoping to add a girl to their ranks so that females will assume the majority. And while Jim Bob and Michelle are welcoming grandchildren, they aren’t ruling out the possibility they may have a 20th child themselves. The couple’s last child, Josie, was born three months premature and weighed only 1 pound, 6 ounces at birth, but is now thriving. Michelle, 44, addressed the possibility of a 20th child in an interview with Radar Online, saying, “We would love more! I know that my mommy years are probably numbered, and I don’t know how many more children God will see fit to give me. The latest installment in the Duggar reality series, “19 Kids and Counting: Grandduggar First Birthday,” airs Sunday at 8 p.m. ET on TLC.